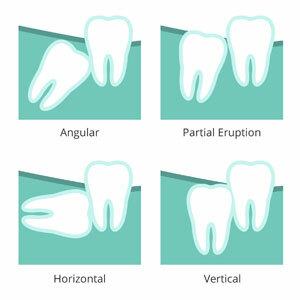 Wisdom teeth will often start developing in your teenage years or early twenties. For some people, the “third molars'” never cause any problems. 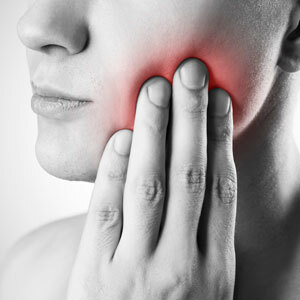 However it’s quite common for people to need to have their wisdom teeth removed by a dentist or oral surgeon. Why Do Wisdom Teeth Hurt? By the time our wisdom teeth start to “erupt” or come through, our jaw is usually fully developed at its full adult size and there simply isn’t enough space for the other four teeth. Without enough room to develop properly, wisdom teeth can become impacted – that is, unable to come through any further – or grow at an angle and push against your other teeth which can lead to gum and cheek irritation and usually quite a bit of pain. Are There Risks To Not Getting My Wisdom Teeth Removed? If your wisdom teeth can’t come through properly, in addition to feeling uncomfortable you are also potentially causing further damage to your teeth and gums by delaying investigation and extraction. Tooth Decay & Gum Infection: impacted wisdom teeth often cause food, saliva and/or bacteria to collect around the tooth and gums. This can lead to tooth/gum infections that are usually quite painful for the patient and may cause decay to form in the wisdom and surrounding teeth. Cysts: often a cyst (fluid filled sack) can form in the tissue surrounding your wisdom teeth. While painful in itself, if left untreated a cyst can continue to grow, may develop a tumour and can even lead to further tooth decay or serious jaw issues. How Do I Know If I Need To Get My Wisdom Teeth Removed? Only an examination by an experienced dentist can tell for certain whether you need to get your wisdom teeth removed. Often people wait until they are experiencing pain or discomfort to see their dentist. At Superior Smiles we perform thorough diagnostic investigations during your regular check ups so that we can work with you to manage wisdom teeth development and removal. We can also assist with emergencies in wisdom teeth extraction if you are undergoing a restorative or orthodontic treatment. At Superior Smiles we can perform simple and complex wisdom teeth removal procedures. We offer in house IV sedation and our convenient location within the Rose Aesthetic Centre with maxillofacial surgeon Dr Kate Mortlet-Brown located within the complex ensures that in most cases we won’t have to refer you elsewhere to have your wisdom teeth removed. Contact Superior Smiles in Fremantle to Schedule your visit today! Payment plans and interest free finance via Zip Money are available. In a beautiful and relaxing environment along Perth's coast in North Fremantle, we deliver an array of dental solutions to serve your entire family's dentistry needs. We help dental clients from Mosman Park, Peppermint Grove, Cottesloe who often visit for cosmetic dentistry. While many who are looking for a family dentist come from East Fremantle, Fremantle, Palmyra, Bicton and White Gum Valley. We are even the preferred dentist for clients from South Fremantle, Beaconsfield, Melville and Attadale.